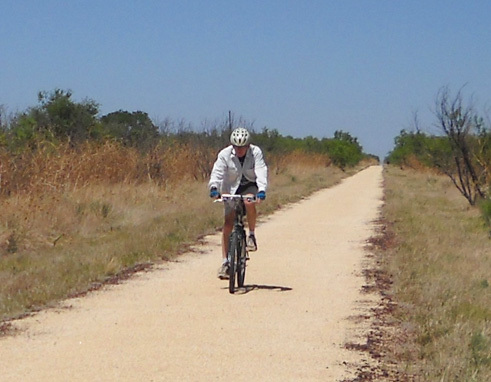 the Trailway are open to the public from Estelline to South Plains . 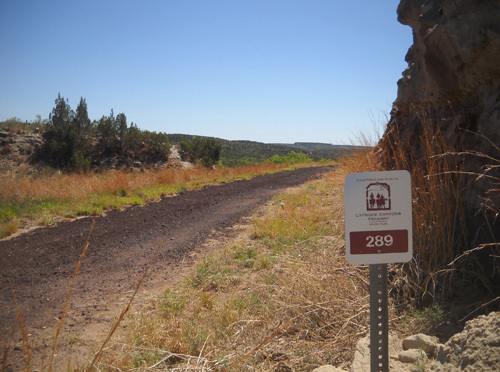 . ."
Last year I presented a little bit of information about this Rails-to-Trails conversion which is part of Caprock Canyons State Park. Its land is included in the 15,313 acres comprising the state park but it's a separate, nearby unit. We didn't have time then to run, hike, or ride our bikes on the trailway. I've been looking forward to exploring some of it this trip. 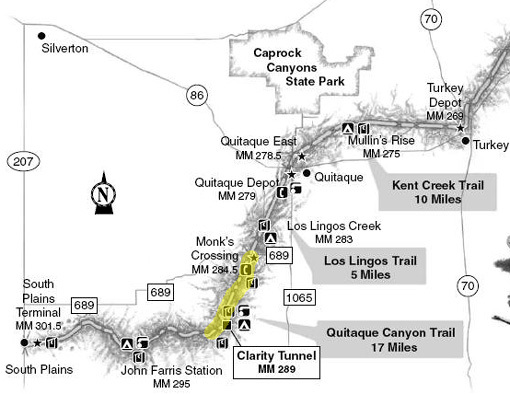 There are eight trailheads for six continuous segments of the trailway. 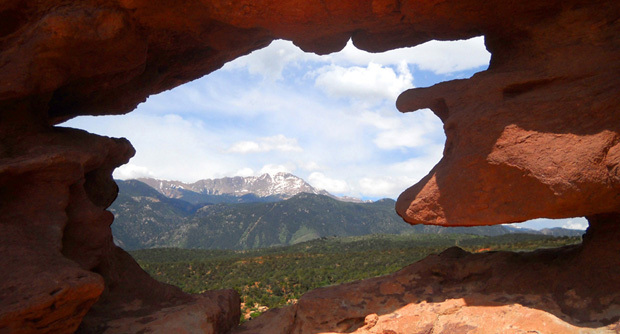 The closest access is in the town of Quitaque (pronounced "Kitty K") a few miles from the entrance to the state park. 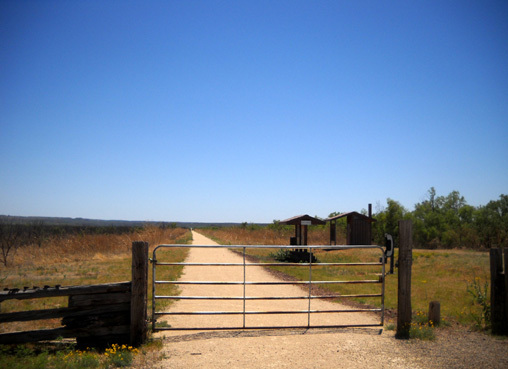 Visitors pass the inconspicuous trailhead on their way to the park on FM 1065. While studying the trailway map and visitor's guide we picked up in the park last year I assumed I could just hop on my all-terrain bike in the campground and ride three miles to town, then get on the trailway and go as far as I wanted in either direction. We got a surprise when I mentioned that plan to one of the rangers in the visitor center. I'm real glad I mentioned it or I would have been very disappointed. Turns out, most of the trailway is covered with jagged cinders that are rough on feet, mountain bike tires, and hooves. Only four miles are nice, smooth crushed rock that is user-friendly. And those four miles don't start in either direction at Quitaque -- to access those we'd need to drive several miles south to the Monk's Crossing trailhead and ride from there. 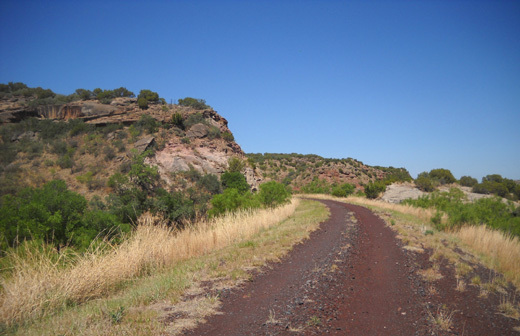 Morphing from canyon to caprock escarpment; the trail is very nice here. The ranger also cautioned us against thorns and stickers that blow onto the trail and cause a lot of grief to cyclists who end up with flat tires while riding. Oh, that sounds like a lot of fun, doesn't it?? I was starting to get second thoughts. Even before hearing this information Jim wasn't real enthusiastic about riding the trailway. Now he was even less interested in joining me for an eight-mile ride jaunt on the trailway (four miles out, four miles back, maybe more depending on the trail and the accuracy of the distances). The smooth, light-colored crushed rock surface ends right before the Clarity Tunnel going westbound. 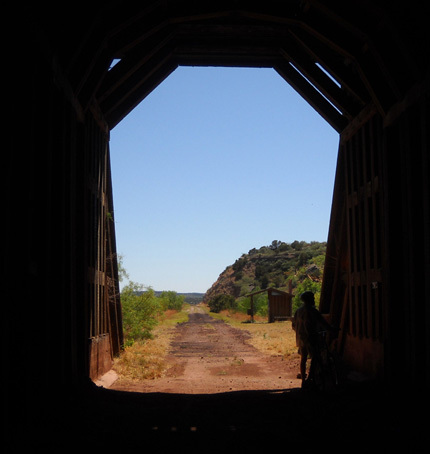 I was determined to check it out, however, especially since at the end of the good treadway at four-plus miles was the Clarity Tunnel, renowned for its thousands of Brazilian free-tailed bats. I've been to at least two other locations where bats attract tourists in the warmer months (Carlsbad Caverns in NM and one of the bridges in Austin, TX) and I wanted to add another locale. Besides, it'd be an interesting experience to walk my bike through the tunnel. Visitors must dismount and walk quietly so they don't disturb the bats. through the Clarity Tunnel; no tracks or trains now. Note the dust. In the end, Jim decided to go with me. He figured he could always turn around early if he didn't like the trail and he'd just wait for me to come back to the trailhead. Jim rode his Trek mountain bike and I was on our Specialized TriCross, a cyclo-cross bike that can pretty much go anywhere but isn't (yet) equipped with knobby tires -- and does not do well with thorns. The trailway is divided into six different trail segments that vary in length from five to seventeen miles. 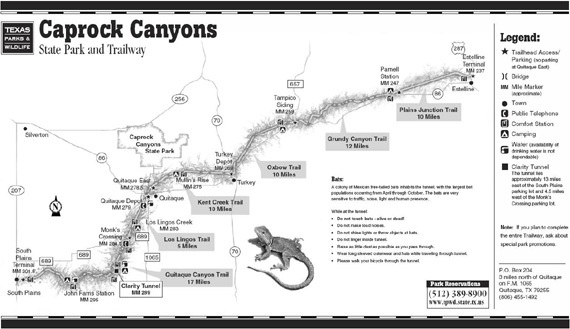 Maps are available online or at the Caprock Canyons SP visitor center. There is a fee to use the trailway but I don't know how much it costs. Day users put their fees in a collection box at any of the trailheads. 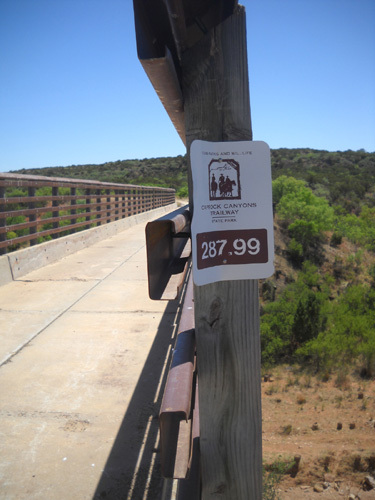 Since we have a Texas state parks pass we didn't have to pay for a permit at the trailhead or park headquarters. Before it was abandoned in 1989 this rail line was a branch of the Burlington Northern railway system. It provided a route for people living on the South Plains of Texas to send their farm products and other goods to markets back East. 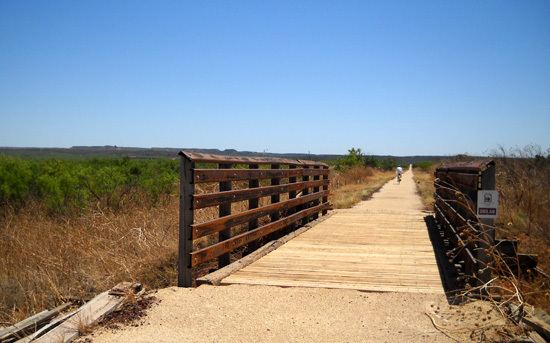 In 1992 the railway land, structures, and trestles were donated to the Texas Parks & Wildlife Department (TPWD). The Rails-to-Trails Conservancy assisted in converting the abandoned railroad corridor into a multi-purpose recreational trail. Jim approaches one of the trestles on the smooth crushed rock surface. It looks like there's still a lot of work to be done with resurfacing, however, if 60 miles of the trailway still have the type of sharp rocks/cinders I encountered on the other side of the Clarity Tunnel. Just look at the cinders on any rail line still being used -- would you want to run, walk, or ride on those very long? The problem is money. Considering the lack of funds that even Texas has for parks (unfortunately, Texas is in financial straits now, too), I'm grateful for what they are able to provide here. The section of trail we rode from Monk's Crossing to the Clarity Tunnel is in great shape. 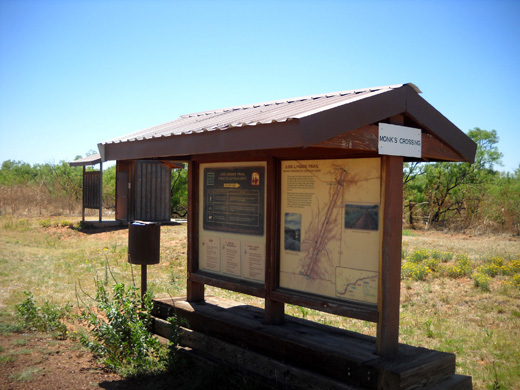 There are handsome interpretive kiosks at the trailheads, toilets and benches here and there, informative signs along the route, and mile posts. I don't know if all the segments have these amenities, however; we saw only a short section. TPWD has produced a fine illustrated booklet that's free for the taking. 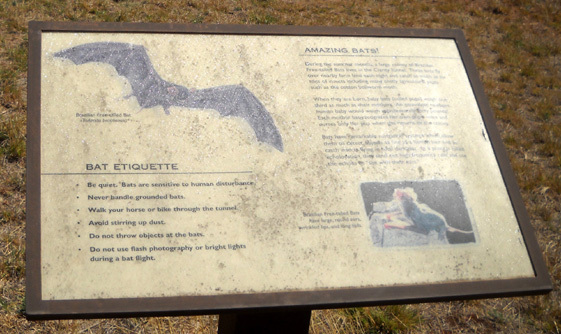 It describes in great detail what is significant at many of the mile markers along the trail -- all kinds of interesting historical, cultural, geological, and natural information. That's how I first learned about the bats that inhabit the Clarity Tunnel each summer. Other things I read in the booklet made me curious, too. It's easy to find Monk's Crossing, the trailhead where we began our bike ride. We took FM 1065 south from the park through the little town of Quitaque and down to FM 689 (about seven miles). The trailhead is another three miles west. After scanning the information in the kiosk at Monk's Crossing, we set out on a new little adventure. 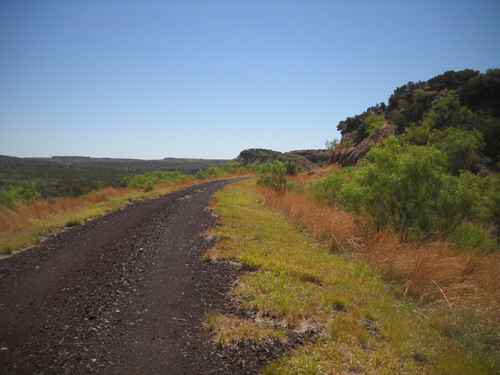 The short section of trail we rode (I ended up going five miles out and five back, Jim a little less) is part of the Quitaque Canyon Trail, which runs for 17 miles from MM 300 to MM 284. 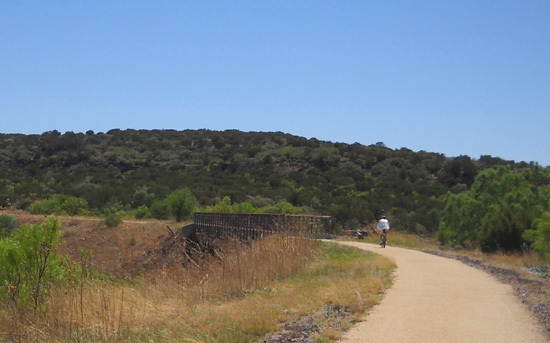 This is one of the six trail segments that comprise the entire 64-mile trailway. (I don't know why they divided it into six segments since the segments are all connected.) We rode from about MM 284 at Monk's Crossing west to a little past MM 289 and back. The mile markers along the trailway were originally used by the railroad to measure the distance in track miles from a point in Fort Worth; they increase the farther west you go. 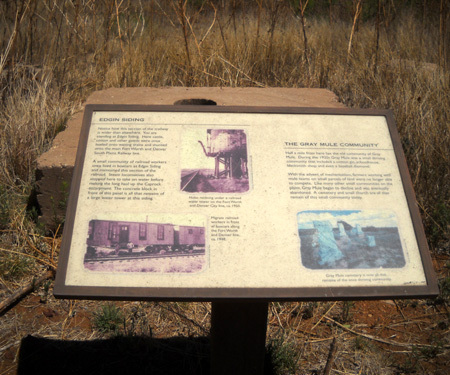 The first interpretive sign we saw (below) was at MM 285, location of once-busy Edgin Siding. 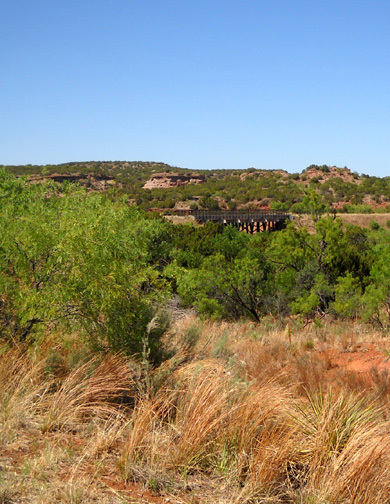 Steam trains used to stop here to fill their tanks with water before making the long haul up the caprock escarpment. Passengers could board the train here, and cattle and other goods were shipped out. Another sign points to four tall concrete towers in the distance. When the railroad was under construction in the 1920s 10,000 rail car loads of sand and gravel were extracted from a large deposit at that location and washed in the towers before being used for construction along the line. Jim mostly rode on ahead of me. I'd stop to read a sign or take a picture, then ride fast to try to catch him = a good speed workout! 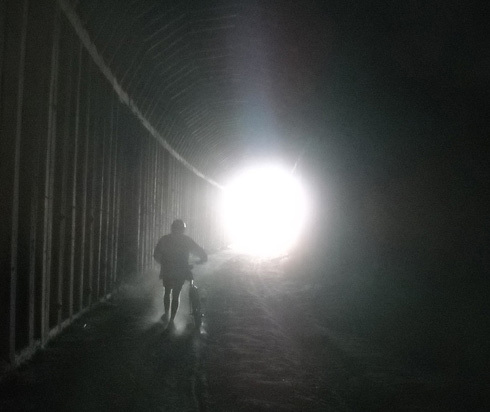 Despite all my stops we rode the first 4� miles to the Clarity Tunnel relatively fast. In the southwest direction we had a net elevation loss and a tailwind. We knew it'd be harder on the return in the headwind, going slightly uphill. There are lots of wooden trestles over dry creeks in this section and one concrete span over a larger dry wash. It's so dry now that we didn't see any water in any streams. Ranchland surrounded us the first couple of miles, then we entered hillier canyon lands as we approached the caprock escarpment. 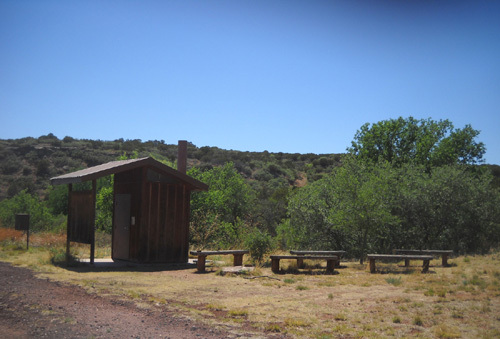 A hundred yards from the eastern entrance to the tunnel there are interpretive signs, a covered picnic table, and a toilet. We stopped to read the signs quickly. We'd already read about "bat etiquette" and knew the drill here -- walk our bikes (or horses, for equestrians) through the tunnel, be quiet, avoid stirring up dust, don't shine any lights on the walls or ceilings, don't use flash photography, don't throw any objects at the bats, and DO NOT TOUCH any live or dead bats we might encounter. 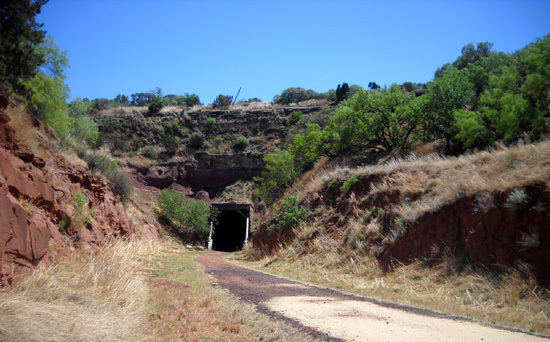 Back in the 1920s railroad construction engineers built two tunnels along this line through the Caprock Escarpment -- the 790-foot long Clarity Tunnel and the 400-foot-long Gowdy Tunnel a mile to the west. The Clarity Tunnel was shortened to its present 582-foot length in 1973 after a train derailment caused part of the tunnel to collapse. Engineers organized a massive dirt-moving operation to find the entrance and free the trapped rail cars. 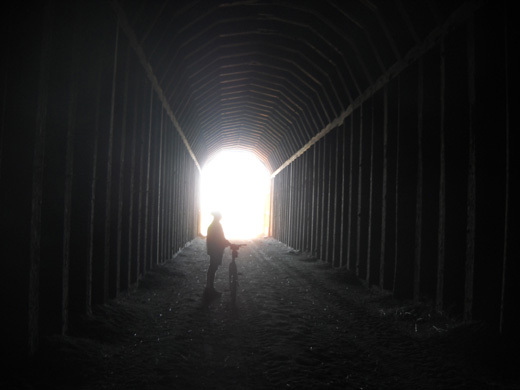 One advantage of the shorter distance is that current trailway users don't need a flashlight or headlamp when walking through the tunnel. Although the middle of the curve is pretty dark before you can see the light at the end of the tunnel (literally! ), there's enough ambient light from each entrance to make your way safely through. Our eyes adjusted to the decreasing light as we approached the darkest part of the tunnel. It's probably just as well that you can't see exactly what you're walking through! The "dust" (i.e., mostly bat guano) is very fine and easily kicked up. I didn't see or feel anything of substance, like a dead bat or a rock, in that section. My main sensory reaction both times I was in the tunnel (out and back) was the SMELL -- musty and dusty and just odd. The trail surface is mostly bat poop, after all. This probably isn't the best stuff to be inhaling. We should have worn lightweight dust masks. I think I'd avoid the tunnel entirely if I was asthmatic. We didn't see or hear any bats while we were in or near the tunnel. They were all fast asleep (or pretending to be). They don't come out to feed until dusk. A camera shot finally came out well-focused as I got close to the far entrance. That was cool! we agreed when we emerged at the other end of the tunnel. And it was, literally and figuratively. There were benches at the far (western) entrance to the tunnel, which leads us to believe that's where the bats fly out each evening from April to October (no benches at the other entrance). The bats hunt during the night, catching tons of harmful insects on nearby agricultural land, and return to the tunnel before dawn. There are additional interpretive signs on this side of the tunnel, and another bathroom. 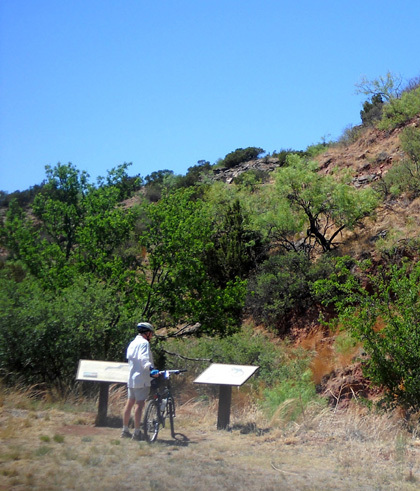 Jim reads the signs about canyon flora and fauna. This tunnel isn't just popular for its evening bat show for half of the year. According to one of the signs along the trailway, it "has always held a certain mystique and allure for residents of the Quitaque Valley. 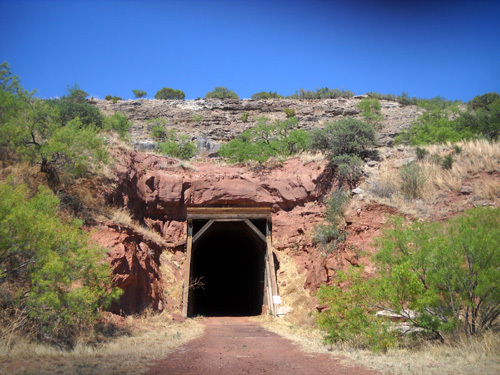 Since it was completed in 1927, the tunnel has been a popular destination for picnics and family outings, and generations of children have played in its shadows." Are you kidding me? 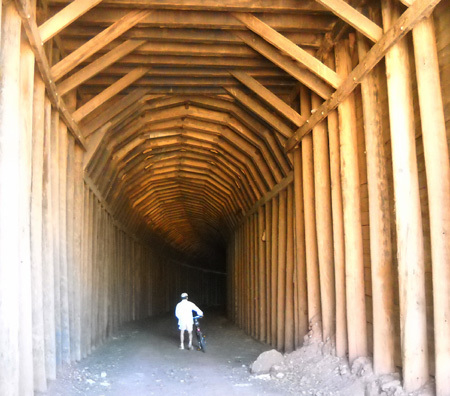 This was an operational railroad tunnel until 1989!! Maybe the trains didn't run on the weekends, or the locals were very, very sure of their schedules. I can't imagine enjoying a picnic or letting your kids play inside when there was the possibility of a big 'ole train blasting through. Or, as Jim says, maybe there isn't much else to do in the Quitaque Valley. THAT WAS FUN -- LET'S DO IT AGAIN! There wasn't much choice, actually. 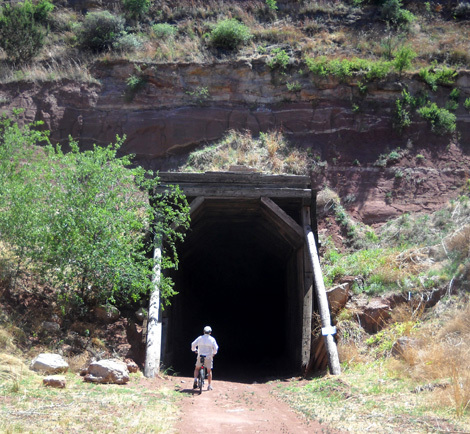 Jim and I were on the far side of the tunnel now and we had to go back through it again to return to our truck. Jim decided to turn around there. He didn't want to overdo it before the Jemez Mountain 50K in another eight days. That still gave him about 9+ miles on this ride. I was curious about what was around the next bend (again, literally and figuratively) so I continued on despite the sharp black cinders that comprise the trailway on the other side of the tunnel. I rode only about half a mile, however, before turning back because I feared puncturing one of my tires/tubes. The ride back wasn't nearly as much fun, although I enjoyed walking through the dark tunnel a second time. I was alone and in total silence. 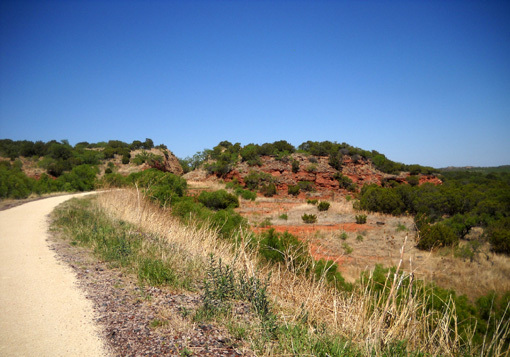 Once past the caprock escarpment, where the trailway was less protected by hills, rocks, and trees, the headwind, gusts, and slight elevation gain were more challenging for both of us. The ride back felt twice as long as going outbound. One of the longer trestles is in the background. I rode a total of just over 10 miles, fairly short but a good workout. Fortunately, I didn't get a flat tire from riding on the cinders. If I had, the walk back to the truck would have been interminable. We don't have a spare tube for the TriCross bike yet! I was really hoping to ride a lot more miles on the trailway but that isn't going to happen until/unless TPWD ever replaces more of the sharp cinders with a better surface. It's a shame that so much time, effort, and money has been expended to convert this abandoned railway into a fairly scenic recreational path . . . that isn't being used to anywhere near its capacity because it is so rough underfoot/tire/hoof.